DiskSorter allows one to save file classification reports into a number of standard formats including HTML, PDF, Excel, XML, text and CSV. In the simplest case, perform a file classification operation and press the 'Save' button located on the main toolbar. 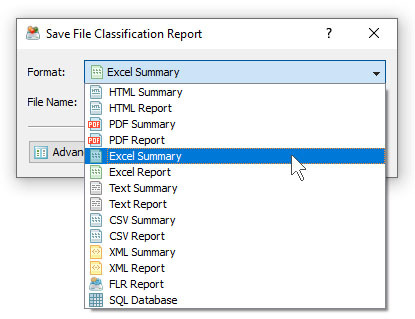 On the save report dialog, select an appropriate report format, enter a report file name and press the 'Save' button. For the HTML, PDF, Excel, text, CSV and XML report formats, the user is provided with the ability to save a short summary report or a longer detailed report, which may be very long for large file systems containing millions of files. 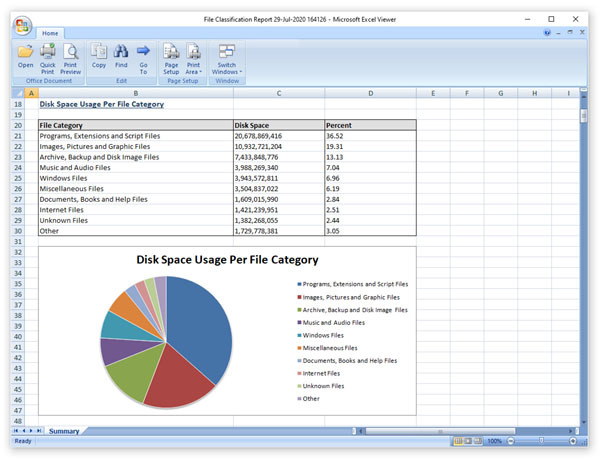 By default, DiskSorter will save a short, summary file classification report in the HTML report format, which will include a list of top-level file categories according to the selected file classification plug-in and a list of tables showing the disk space usage and the number of files per file extension, file attribute, top-level directory name, user name, etc. 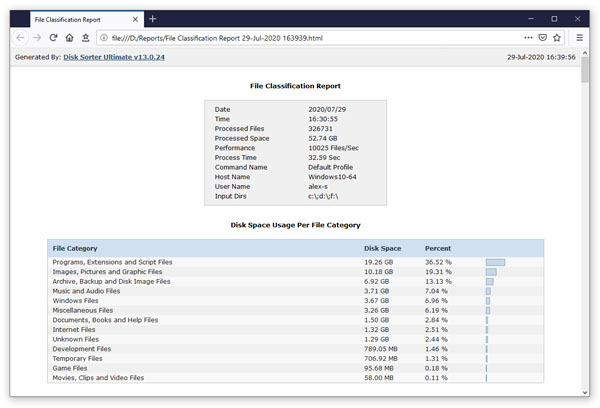 In addition, the user is provided with the ability to save file classification results to the DiskSorter native report format, which preserves all information related to each specific file classification operation and may be loaded at any time by using the DiskSorter GUI application. Sometimes, it may be required to perform additional analysis of file classification results using external tools such as Microsoft Excel. In order to export file classification results to the Excel report format, perform a file classification operation, press the 'Save' button located on the main toolbar, select the 'Excel Summary' report format for a short summary report or the 'Excel Report' format for a detailed file classification report. A summary Excel report will include a list of top-level file categories and a number of tables with pie charts showing the used disk space and the number of files per file extension, file attribute, file creation time, last modification time, top-level directory name, user name, etc. 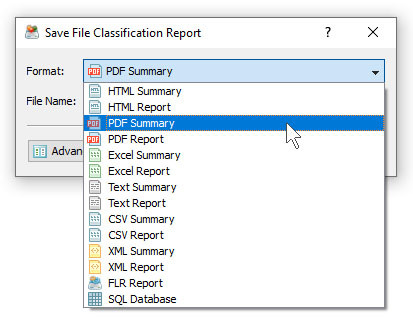 One of the most useful ways to export file classification results is to use the PDF summary or the PDF report formats. Both of these report formats include various types of graphical pie charts showing disk space usage and the number of files per file extension, file category, creation time, last modification time, user name, etc. In order to save file classification results to a PDF report file, press the 'Save' button located on the main toolbar and select the 'PDF Summary' report format for a short, summary report or the 'PDF Report' format for a detailed file classification report. 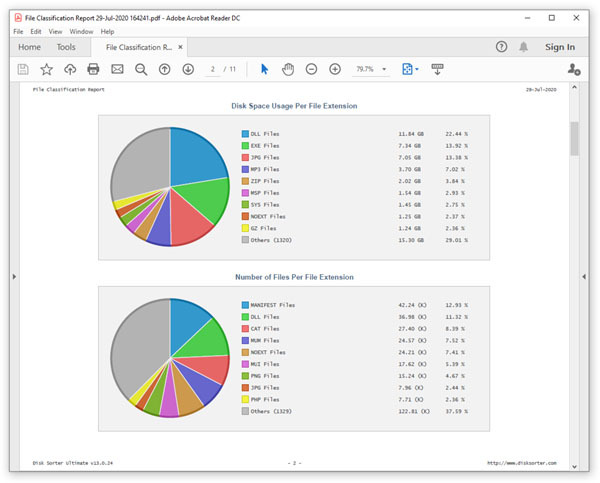 A summary PDF report will include a list of top-level categories of files according to the selected file classification plug-in sorted by the amount of the used disk space followed by a number of pie charts showing the disk space usage and the number of files per file extension, file attribute, file creation time, last modification time, top-level directory name, user name, etc. A detailed PDF report will include an hierarchy of file types sorted according to the used disk space, which may be very long for large file systems containing millions of files.